I grew up going trick-or-treating and have such fun memories. There were some awful costumes (sorry,mom) and some great ones – tons of candy – tricking my sister into giving me my favorites from her bag, the list goes on. 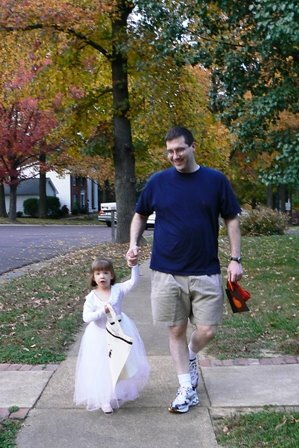 This is the first year Little understood there was something called trick-or-treat and she was all about costumes. This did not bode well for mommy who has had four Halloweens of deciding herself what the costumes would be. This year the plan was: Little = Larry; Bubba = Bob; KB = Laura the Carrot. While cleaning out with Memom, we found the Madeline costume I got at a yard sale this summer and that made the prospect of sewing a Larry costume seem oh so foolish. The plan became Little = Madeline; Bubba = Bob; KB = Laura the Carrot. 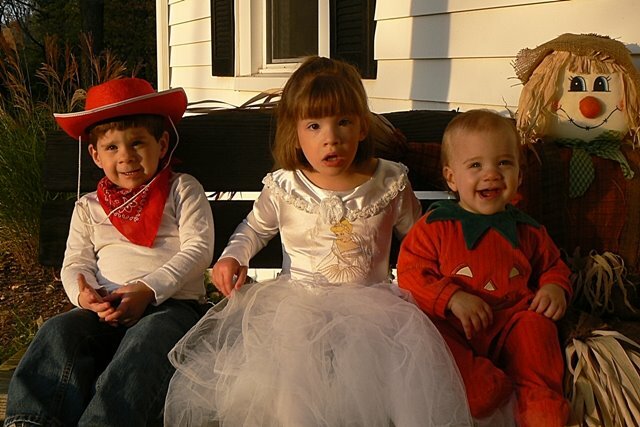 Bubba’s class had a “Pumpkins and Pretend” day instead of a Halloween party. Everyone wore their costumes to school and played pretend throughout the morning – a GREAT idea. Only problem? 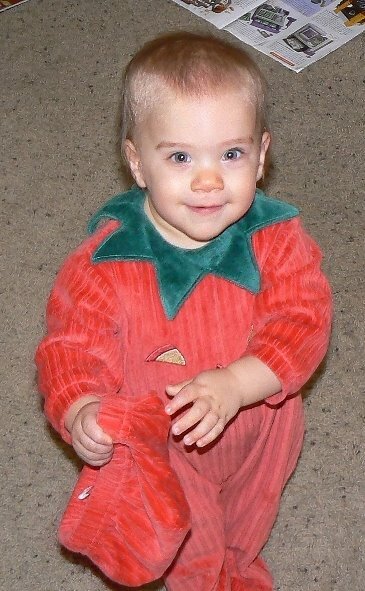 Who wants to pretend to be a tomato all day. 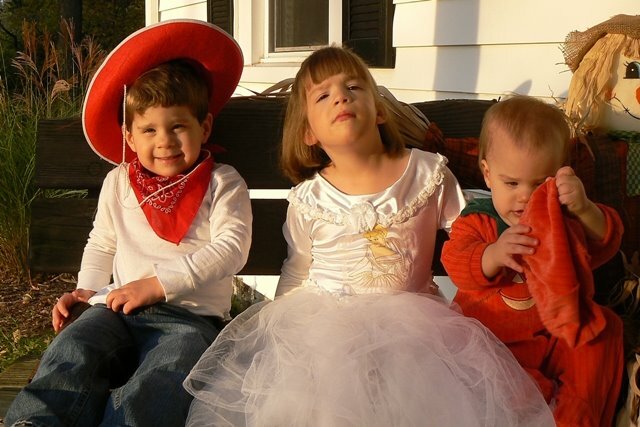 New plan: Little= Madeline; Bubba = Cowboy; KB = Laura the Carrot. The “base”, if you will, of KB’s Carrot costume was in fact a pumpkin costume – just minus the hat. My logical and exhausted mind decided that no sewing was really necessary if the plan became: Little= Madeline; Bubba = Cowboy; KB = Pumpkin. And it did. And it was good. Wednesday, Little’s class had their Halloween play and party (pictures with another post pending)and I forgot to take her costume. EVERYONE else had a costume and she came up to me and actually said, “I want a costume too, mommy.” Sounds normal, eh? So it rocked my world and we headed straight to the class dress-up area and confiscated a Cinderella wedding dress for the remaining festivities. Little was in heaven. She was also in a lot of chocolate throughout the party and in a VERY wet pull-up, so the dress went home with us to be washed. Little has had it on ever since it came off the line and as of 3:00PM today the costume plan was finalized as: Little= Princess; Bubba = Cowboy; KB = Pumpkin. The photo shoot on the front porch was a hoot. We took about 25 shots and ended up with these two decent ones. Little looks shell-shocked in the first and Bubba is the only decent thing in the second – still I love them both. We went to a little neighborhood just up the street from us – there were sidewalks, leaves changing colors and church members we knew. It was so “small town America” feeling. We only made it through one cul-de-sac (that’s about five houses) and it was time to go. In all it was super fun. I was a proud mommy walking down the sidewalk with her precious family. Little was such a little girly girl and KB just kept saying, “DA!” to everyone. 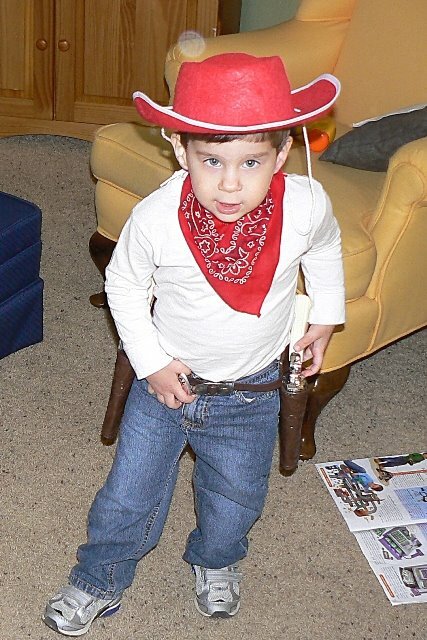 Bubba would NOT take his cowboy hat off and was constantly rearranging his guns and saying, “Yipeekayayay!” So sweet. Hope you had even a fraction of the fun!